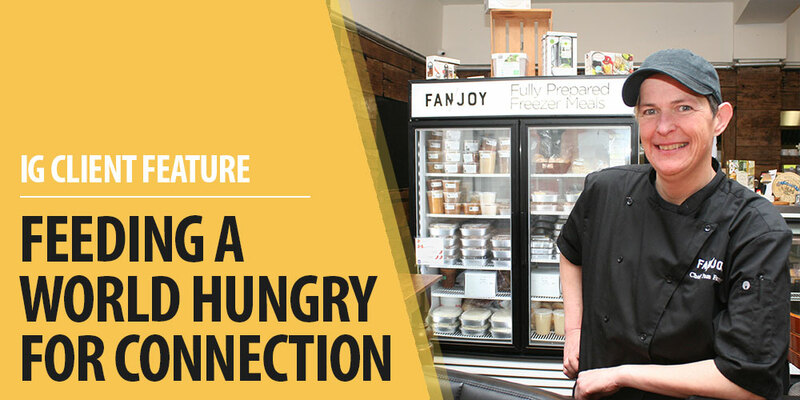 An award-winning Wellington County chef is prepped for a breakout summer creating community connections and well-being by sharing fabulous, farm-to-table foods at FAN/JOY restaurant and kitchen retail store in Hillsburgh. “FAN/JOY is the destination dining place to be this summer in Headwaters,” says owner/operator Chef Pam Fanjoy, whose namesake business is strategically located amid the picturesque villages, rolling hills and pristine rivers of Erin, Caledon, Dufferin County, Mono and Shelburne. Fanjoy made the move to Hillsburgh in 2016 after outgrowing her original location in nearby Erin. Around the same time, she became an Innovation Guelph (IG) client, after a friend introduced her to IG mentor Steve Barrett. Fanjoy enrolled in the Gear Up program while renovating her new location. “It’s been a real lifeline — a fantastic opportunity to learn the core tenets of what makes a business successful,” she says. “Pam’s the real deal,” says Barrett, part of the team of IG mentors who work with Fanjoy. 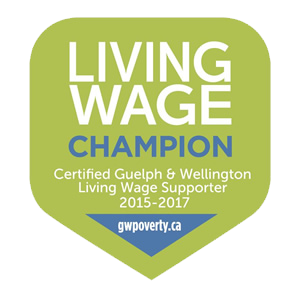 Barrett’s background includes several years in the restaurant business and a degree in hotel and business administration from the University of Guelph. “I’ve also financed/bootstrapped a few businesses, so Pam and I were a good fit,” he says. With Barrett’s guidance, Pam developed systems to scale the business and hire staff. This has allowed her to step out of the kitchen from time-to-time and focus on promoting and growing the business. Fanjoy has also received funding and mentoring through Innovation Guelph’s Fuel Injection Seed Funding Program to launch a new “Cottage-To-Go” service, which will debut in time for the 2018 Victoria Day weekend. It allows customers to plan and order complete meal solutions for pick-up on their way to the cottage or favourite campground. IG mentor Stacey Curry Gunn also worked with Pam to develop a strategic marketing communications plan to support rebranding the business, which was previously named The Friendly Chef Adventures. 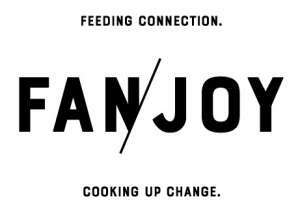 The new brand — FAN/JOY — brings Chef Pam to the forefront, building on her reputation as a rising star in the industry after winning the top prize in the 2016 Chopped Canada competition. Catching the eye of some of Canada’s top chefs at Chopped Canada was a major confidence booster for Fanjoy, whose culinary passion developed later in life. While enjoying a thriving career in clinical social work, in 2007 Fanjoy began taking part-time cooking classes for recreation and stress relief. Soon she was incorporating her hobby into her profession, leading therapeutic cooking classes for clients. The more time she spent in the kitchen, the more she was convinced that she wanted to share her passion full time. So in 2012, she enrolled in George Brown College’s two-year culinary management diploma program. Along the way she honed her skills working at restaurants in Toronto and during a four-month internship in France. Fanjoy was able to finance the down payment for the move to Hillsburgh with the $10,000 Chopped Canada prize and by selling meal plans, pre-paid catering and event services to friends and customers in a crowd funding campaign that raised another $20,000. Community and collaboration have been common themes throughout Fanjoy’s professional journey. FAN/JOY offers inspired, healthy cuisine made from local ingredients in the relaxed, rustic setting. In addition to offering fully prepared meals-to-go, Chef Pam also provides specialty grocery items, as well as full-service catering, hands-on cooking classes and special events.